In an industry like the AFL that is so much about facts and figures the number 200 is a big one. Especially for Daniel Merrett. Merrett will join some very exclusive company when he finishes his career on exactly 200 games on Sunday. He’ll be the second Queenslander behind ex-Fitzroy and Brisbane utility Scott McIvor and the 14th AFL player overall to finish with an even double century. This comes after Mathew Stokes, dual Geelong premiership star turned Essendon top-up, retired after his 200th game last weekend. And it is a club that could gain another member over summer if Essendon captain Jobe Watson, sitting on an even 200 games during his 2016 suspension for the Bombers’ drug saga, decides not to play on. It is a massively significant milestone in the life of an AFL footballer that has been reached in any number of different ways. Current Sydney Swans coach John Longmire wrote arguably the best script. He played his 200th game in North Melbourne’s 1999 grand final win over Carlton and promptly hung up the boots. Former Hawthorn star Brad Sewell endured totally contrasting emotions. He played his 200th in the 2014 qualifying final and was omitted in the following weeks for the preliminary final and grand final. He never played again. Others have been rewarded for long-time excellence with what amounted to a farewell 200th late in their last season. Like St.Kilda’s Justin Koschitzke, Richmond’s Michael Roach and McIvor, who had been stranded on 199 games for an injury-stricken 11th weeks in 1997 before coach John Northey ensured he got to 200 in Round 19. Brownlow Medalist Shane Woewodin, ex-Melbourne and Collingwood midfielder turned Brisbane Lions Reserves coach, happily reached 200 in the last game of a 2005 season in which his side didn’t play finals. It was Round 23 over and out. He played 15 games in his last season. Among the 200-Only Club, Stuart Trott, ex-St.Kilda and Hawthorn player, played a record 19 games in his farewell season and reached 200 in the Hawks’ 1977 preliminary final loss. Merrett will equal Trott’s 19-game run to his 200th game farewell, although for him it’s been a different journey, without any exit year finals to help. The 31-year-old Lions defensive stalwart has played every game when available this season, but has missed three games through illness. And given that two-year-old daughter Matilda is not yet capable of reading she won’t be offended by the assertion she may have been the culprit, and in Rounds 1-7-17 may have inadvertently sidelined her father with an ailment she brought home from day care. Happily for the popular Lions fullback it didn’t happen a fourth time, although it’s fair to say Matilda be quarantined for the next few days just to make sure Merrett is well enough to run out for his 200th and last game against St.Kilda at Etihad Stadium on Sunday. 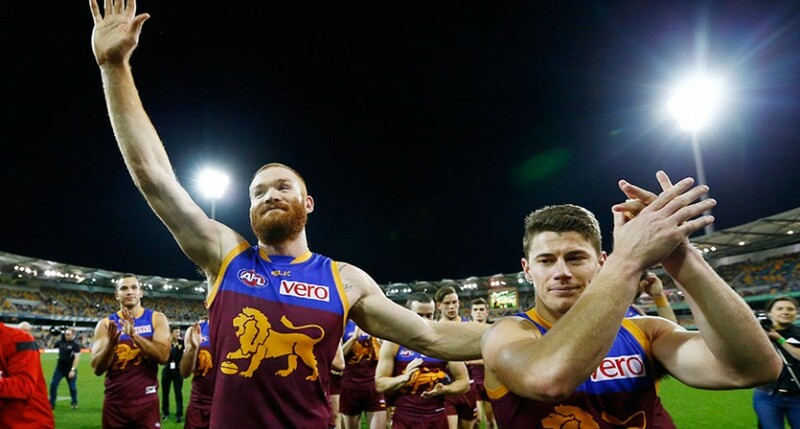 The Lions’ last game of a tumultuous 2016 season will bring to a close a 14-year journey that has seen Merrett play AFL football at 13 different grounds in Queensland, NSW, Victoria, Tasmania, South Australia and Western Australia, plus New Zealand. In addition to 106 games at the Gabba he’s played 28 times at Etihad Stadium. It will be his 29th on Sunday. Also, he’s played at the MCG (19), Subiaco (9), Football Park (9), Kardinia Park (8), Carrara (6), York Park in Launceston (4), SCG (4), Adelaide Oval (2), Stadium Australia in Sydney (2), Marrara Oval in Darwin (1) and Westpac Stadium in Wellington (1). Among current AFL playing venues, he’s never played at Cazaly’s Stadium in Cairns, Manuka Oval in Canberra, Bellerive Oval in Hobart, or Sydney Showgrounds in Western Sydney. He’s tasted success against every AFL opposition – just. He’s one win from 15 games against Sydney (plus a draw), and one win from 12 games against Richmond (plus a draw). Geelong and Hawthorn, with Sydney the power clubs of his era, have been the other prime stumbling blocks – he’s three wins from 16 games against the Cats and two wins from 10 games against the Hawks. He has a perfect success-rate against the GWS Giants – two wins from two games. Otherwise, he has fared best against Carlton (nine wins from 15 games at 60%) and Gold Coast (six wins from 10 games at 60%). Individually, he had a career-best 24 possessions against Gold Coast at Carrara in 2012, and a career-best seven goals against GWS at the Gabba in 2012. Merrett will know little if any of such bland football statistics for, quite simply, it’s not something that interests him. As much as he’s loved playing the game he’s certainly not a football ‘nuffy’. Indeed, he will tell the story of an occasion in his early teens when he walked into the Bundall Post Office to post a letter and was sized up by a big bloke behind the counter. The youngster replied that the Gold Coast-based family was originally from Adelaide. Little else was said, and the youngster went on his way, oblivious to the fact that he had just been speaking to another Merrett. Roger Merrett, who played 313 AFL games, including 164 for the Brisbane Bears – 125 as captain – and coached the club in the second half of 1998. In one of his first interviews at the Lions after being drafted by the club in November 2002 Daniel Merrett said: “When the AFL was on television, I would go “arrghh” and go outside or something”. In his teenage years he preferred rugby league, cricket, and later volleyball and touch football. He started playing league as an eight-year-old, but his ‘career’ came to an abrupt end when a tackle went awry in under 12s. “It was the school rugby league finals, I threw a tackle, knocked my chin, split it open and got knocked out,” Merrett recounted at the time. Instead Merrett joined the strong volleyball and touch football programs at Benowa State High School, and was selected in the South Coast representative teams, the level below state selection, in both. He was also a sometimes fearsome fast bowler in cricket. But as hard as he tried in each of his sporting pursuits it wasn’t until AFL can along by accident that he found something that came naturally to him. And yet even that was something of an accident. In 2001 a bunch of mates played at Surfers Paradise club – ironically at a time when Roger Merrett was president – and he found himself watching a mid-season game of under 18s. The Surfers boys were short that day at Broadbeach, and the big guy with the sandy-red hair was drafted onto the bench to make up numbers. Or so the coaching staff thought. They were in something of a state of apoplexy two hours later after Merrett had dominated the ruck, despite never having played the game and not having played a contact sport for four years. “I first went on to centre-half-forward or back – I’m not sure which one because I didn’t know which was which at the time – and then they threw me into the ruck,” he explained about 14 years ago. But he quickly discovered what fun he had been missing out on. “I loved it. And I got an award of $5. After that you’d give your $2 to play and I was getting $10 as an award each week. It was like ‘this is alright, I’m earning a bit of money here’,” he laughed. Merrett quickly found his way into the Surfers senior team, and, after catching the eye of AFLQ Development Manager Mark Browning, was given a run in the Lions Reserves team in their last game of the home-and-away rounds, where he received limited game time. Little wonder, really. It was just his ninth ever game of football. By July 2002 he was in the Queensland under 18 team, and later that season he played one solitary senior game for Southport in the then AFLQ competition. Among the countless pieces of advice he got from Browning and others via the Talent Search program was to take a trip to the Gabba and see first-hand what AFL football was all about. So he did. Three times in August-September. Melbourne showed genuine interest in Merrett in the lead-up to the draft, but his preference was always to stay in Queensland. It was a draft headed by Brendon Goddard, Daniel Wells and Jared Brennan at #1-2-3 to St.Kilda, North and Brisbane respectively, and a little-known Tim Walsh to Western Bulldogs at #4. He played one game. Jarrad McVeigh, Steven Salopek, Andrew Mackie, Luke Brennan, Hamish McIntosh and Jason Laycock completed the top 10. Troy Selwood, Merrett’s ex-teammate and long-time close mate who is now in a football administration role at Geelong, joined the Lions at #19. Merrett was chosen by the Lions at #30, ahead of Jobe Watson, a nominal father/son choice to Essendon at #40. Kade Simpson went to Carlton at #45 and Adam Selwood went to West Coast at #53. Of all the players taken in the 2002 AFL National Draft only Goddard, Wells, McVeigh, Mackie, Jay Schulz (#12), Will Minson (#20), Tom Lonergan (#23), Merrett, Sean Dempster (34FS), Simpson, Adam Selwood, Ryan Crowley (#55) and Nick Malceski (#64), plus Watson, are still on AFL playing lists. Merrett, a first-year player when the Lions won their third consecutive premiership in 2003, just missed the club’s golden era and will be disappointed just to have played only two finals in 2009. But he’ll leave a lasting legacy as one of the game’s premier key defenders of his time, and a player liked and respected by teammates and opposition alike.